David Brabham is back in a prototype for 2007: he’ll be racing Duncan Dayton’s Highcroft Racing Courage LC75 Acura in the 2007 ALMS, with his co-driver yet to be named. Dayton himself will be the third driver at the longer races: Brabham’s regular partner will be announced “shortly”. "Working with Highcroft and Acura on this new venture is a fantastic opportunity,” said the Australian. “It is an amazing program and I'm delighted to be part of this new era in sports car racing." LMP2 in the ALMS should see some highly competitive racing among a whole host of new cars / new teams. "I'm thrilled to have David on board to help Highcroft Racing develop our new Acura Courage LMP2 package," said Duncan Dayton. "He's not only an extremely talented driver, but his extensive experience working with so many different marques will be a great help with our chassis development program." David Brabham has been on the Sebring podium every year since 2003 (Bentley, ACEMCO Saleen, Aston Martin DBR9, Panoz Esperante – a class winner in three out of those four) and the Sebring podium will be the first target next March. "After being away from Prototypes for two years, I'm really looking forward to getting out there on the track and mixing it up with everyone," he continued. "The team is very professional. Its facility in Connecticut is amazing; it's one of the nicest race shops I've ever seen. It's a fantastic facility for the team to be based out of. I'm really excited about the upcoming season." Brabham enjoyed his first laps in the team's new Courage Acura at a private test, some run in darkness / rain, at Homestead last Tuesday and Wednesday (November 28-29). 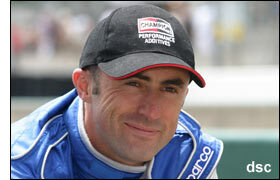 More to come from David Brabham today (December 4) - here.